Industrial stocks are down again Wednesday after the resignation of White House economic advisor Gary Cohn amid President Donald Trump’s continued push for his proposed tariffs. 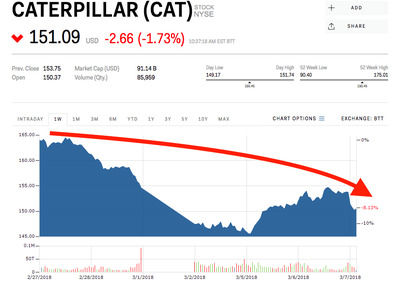 Caterpillarwas down more than 2% in trading Wednesday morning, GEwas down 1.13%, and Boeingwas down 0.81%. Industrial stocks are taking a hit Wednesday as new tariffs on imported metals seem to have one less obstacle after economic advisor Gary Cohn’s resignation Tuesday afternoon. Caterpillar was down as much as 2% in trading Wednesday morning, and down 8% for the week. GE was down 1.13%, and Boeing was down 0.81%. White House Economic Advisor Gary Cohn resigned late Tuesday, citing President Trump’s promised tariffs of 25% on imported steel and 10% on aluminium as the final straw. His absence potentially clears a remaining hurdle to the new taxes becoming law, and creates a void that could have serious implications for the broader US economy. While shares of metals producers like US Steel have gotten a boost from all the talk of tariffs, most industrials have fallen in the week since. Boeing, which imports metal for its factories in Washington and South Carolina, is down 5.3%, or more than $US10 billion of book value, in the past seven days. The new tariffs come at a particularly inopportune time for automakers as well, who import much of the aluminium used in new vehicles from Canada, two industry experts told Business Insider on Wednesday.